Donald J. Trump, Will You Please Go NOW! | Name-Brand Ketchup. ← Don’t they get it? 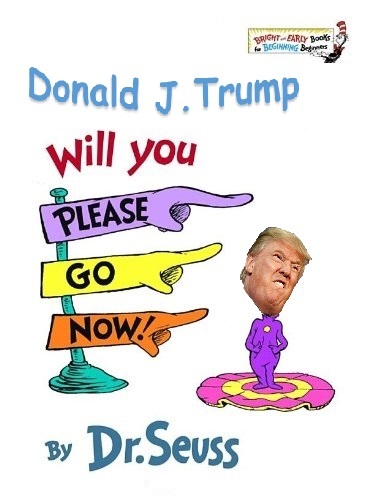 Donald J. Trump, Will You Please Go NOW! You can go by Trump Airlines if you like. If you like you can go in an old blue shoe. Donald J. Trump, I don’t care how. You can go by balloon……or zeppelin. OR You can go by camel with a Muslim guide. You can go by school bus……or jet. You can go with a……………..BOOM! Will you leave this room! I said GO and GO I prayed….